When the sealer wears down on sealed tiled floor dirt will become ingrained in the pores of the tile and floor becomes more and more difficult to clean effectively. Even hard wearing tiles like Quarry tiles will experience this problem over time more so if you use acidic floor cleaning products to regularly clean your floor as they slowly eat away at the sealer. 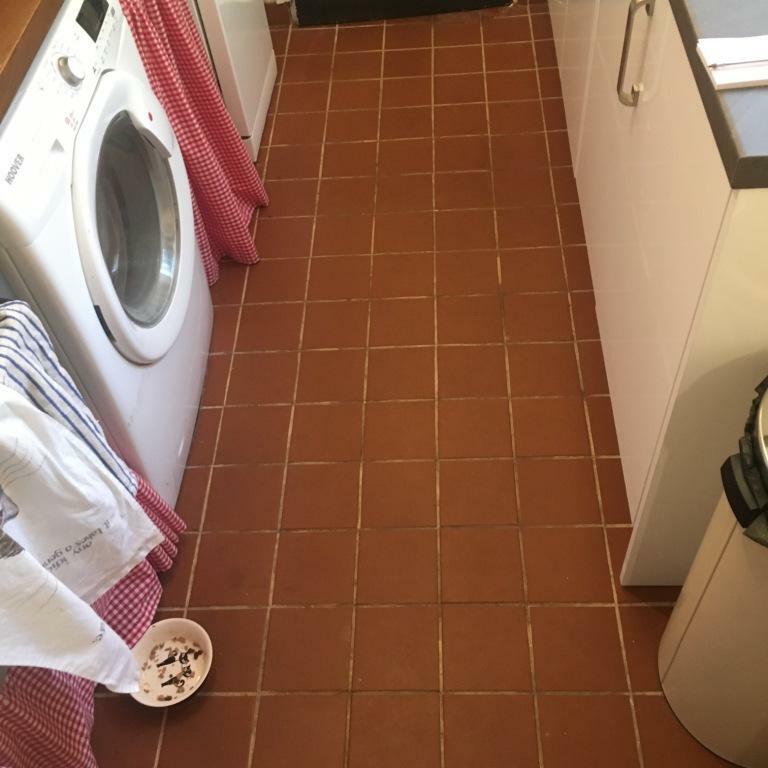 This is a problem we come across relatively often and was the case this customer, living in the town of Salisbury contacted Tile Doctor for assistance. I paid them a visit to survey the floor and arranged a date to come back a give these brown Quarry kitchen tiles a thorough clean and fresh seal to provide durable protection against future soil build up. 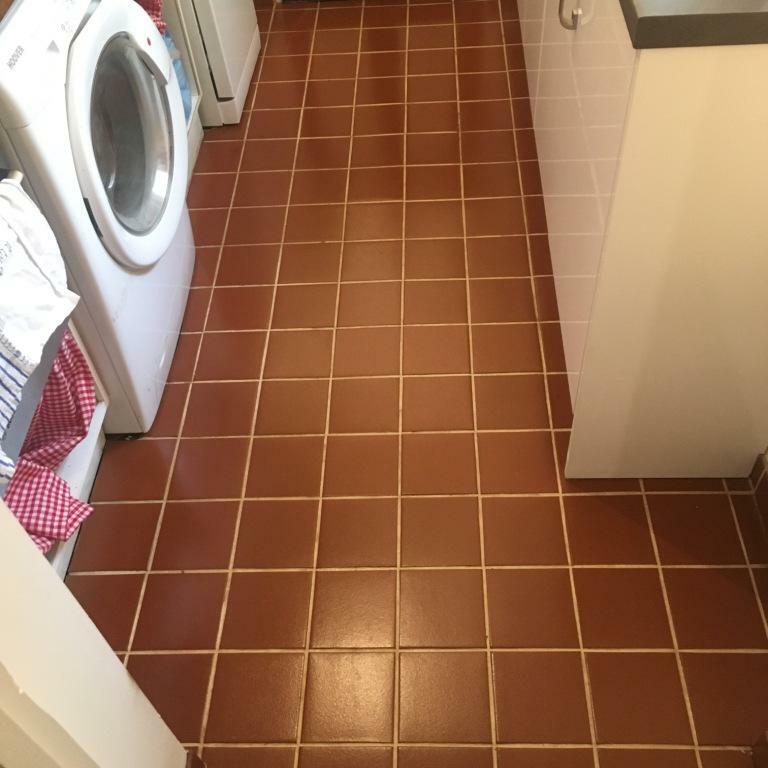 Taking a close look at the tiles, it was clear that they would need to be cleaned using a strong solution of the high alkaline Tile Doctor Pro-Clean, with special attention to be paid to the grout and to deal with some spots of grout haze. To begin, Pro-Clean was applied across the floor and left it to dwell for 15 minutes to eat through any old sealer and dirt. A black pad was then to a rotary machine, and this was used to scrub the area throughly, lifting the muck away. Following this, a wet vacuum was used to remove the dirty cleaning slurry. Next, I tackled the grout haze around the edges, by applying Tile Doctor Acid Gel to the affected areas, which is a mixture of Phosphoric and Hydrochloric acids in a handy gel form. This was scrubbed again with a black pad and rinsed with cold water to neutralise the area. Having successfully eliminated the dirt and grout haze, I left the floor to dry for a couple of days. Upon my return I tested the area for damp using a damp tester; this should always be carried out before sealing as excess moisture can negatively affect the performance of the sealer. When satisfied with the results of the damp test, I proceeded to seal the floor with five coats of Tile Doctor Seal and Go, which is a topical sealer suitable for sealing internal, unsealed porous surfaces. It works by building up a durable surface seal, preventing any dirt from becoming ingrained in the stone. Additionally, Seal and Go provides a subtle, but pleasant looking, low sheen finish and being water based no smell is given off as it dries. The customer was very pleased with the results. Since she had struggled to keep the floor clean, I made sure before leaving the property to give the customer some maintenance tips to help her maintain the appearance of the Quarry tiles. I also assured her that Tile Doctor are always on hand to assist if any new problems occur. This entry was posted in Tile Cleaning Activities by TileProf. Bookmark the permalink.